From VW Fuse Boxes and VW Beetle Complete Wiring Harnesses, to Ignition, VW Turn Signal Switches,VW Headlight Switches, Wiper Washer Switches, Emergency Flasher Switches, Door Contact Switches, Oil Pressure Switches, Brake Light Switches, and relays, we have the quality Volkswagen electrical parts you need to restore your car. 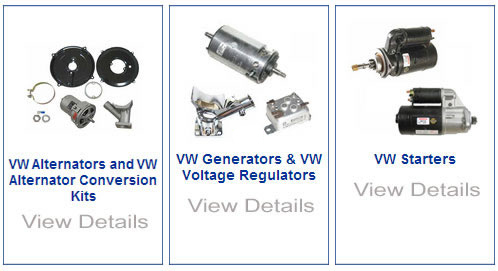 Our Volkswagen Electrical Parts are made to fit your VW Bug, Super Beetle, Karmann Ghia, Bus, Type 3 and Thing. Remember there are absolutely no returns on all VW electrical parts once the item has been installed. If you have any questions or concerns about your parts matching up, please contact us before you install any electrical item. We are here to help, 1-800-231-1784. The fuse box is the center of the electrical system in your VW. With the exception of the battery main feed, all other wires get power from or send power through the fuse box. The fuse terminals for both the electrical contacts and the fuses can weaken over time and break. Corrosion also causes issues with electrical conductivity. We offer fuse boxes and original European ceramic fuses to get your VW's power where it is needed. Turn signals, headlights, brake lights, wipers, reverse lights & even the ignition coil are all turned on by switches. The oil pressure warning light in the speedometer? It gets it's signal from the oil pressure switch. Whether you are looking to replace all the switches in your VW or you just need a new headlight relay or turn signal relay, we've most likely got it. All switches are compatible with 6 and 12 volt electrical systems. Turn signal & flasher relays as well as headlight relays are only compatible with their marked electrical voltage. Most electrical issues in old VWs are caused by shorted or incorrect wiring. With who knows how many owners having their hand at "fixing" the wiring at some point we highly recommend starting from scratch and rewiring your complete VW whenever possible. We offer complete, factory color coded harnesses for most models. The wiring harness are all direct factory replacements that are factory length and preterminated. No splicing or modifications are necessary to fit unmodified VWs. Positive and negative battery cables are prone to corrosion and can cause starting and charging issues. We offer battery boxes and battery pads to contain your battery and prevent leaking that causes the rust under the battery. Battery terminal covers will prevent an inadvertent electrical short which can lead to a fried electrical system or worse, a burned VW! If you're looking for a way to make your VW stand out at the next car show or cruise night then these headlights are for you! A LED "halo" lining the 7" headlight bulb these headlights will give your VW some attitude. The headlights come with a H4 headlight bulb and feature a white or programmable color changing LED halo ring. We even offer the bulbs with a LED turn signal or for the more macabre crowd, a skull bulb deflector.